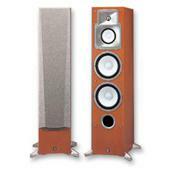 These speakers were designed for home theatre and music playback. When i say designed, they are what gives Yamaha its great reputation and are very much apart of the reason that Yamaha are still rocking it today. Once you hear these beauties, you will be left with goose bumps and a satisfaction of having listened to a true loud speaker. I have owned these for some years now and can assure you that these are the real deal from Yamaha and i know from experience that these belong in no other place than my own. No weaknesses at all. The only weakness is the fact that they are now discontinued. I've owned the basterds for 8+ years and blow away anything I've ever heard or owned before them, i.e. Infinity, JBL, Cerwin Vega, Klipsch, Polk, Boston Acoutsics Jamo and KEF. I won;t even mention Pioneer or Kenwood home speakers in this mix as they are, to be quite honest, particle board encased trash. If you can find a a used pair of the Yamaha's that are in great shape, get em as they are discontinued.